Just a quick post to show off the newly painted siding and stained rafters. While there are still a few details to take care of, the outside is basically finished. I really like how everything has turned out, but I’m not quite sure about the color of the siding. I think it skews a bit yellow even though the pictures don’t show it too well. My wife, who did most of the painting, says she likes the color, but she should since she picked it out. When this whole project started I planned on buying gray painted containers to have a gray cabin when I was finished. When I ordered my shipping containers I was told their standard color was now tan and I could only have gray if I ordered five of them. My plan was to eventually paint them gray, but that just hasn’t happened. The “tan” was starting to grow on me until this, which now raises the question: do real men have yellow hunting cabins? Will you be doing a recapture of hours and expense to share? Very interesting project and thank you for sharing! Not going to venture on the Tan vs Gray thing. Both work it would seem. Someday, possibly this winter when I’m really bored, I will try to add up the hundreds of receipts I have. The final cost will probably be somewhere north of $35K fully furnished. In regards to time, I will have to make a really rough guess. I figure I’ve made at least 30 trips to my land since the start of this project. My time actually working at the cabin probably averages out to 10 hours or so each trip, with maybe 3 hours or so from an assistant – when I had one. That’s close to 400 hours. This excludes the 6 hour round trip drive, all the prep work ahead of time, buying building materials, Ikea trips, etc. I also probably have a couple hundred hours invested in the design and drawings. I think I need a vacation – maybe at my cabin someday. I’ve uploaded some interior pictures to the gallery page. Keep in mind that the interior is far from being done and probably won’t be until next summer. The “bathroom” and plumbing is my next big project that I will start in the spring sometime. Love it! Would love to see inside photos. I love the color too. Fantastic job!! Are those shutters on the outside? To what purpose? A fabulous project! Now you can relax! Those are not shutters, but the original doors of the shipping containers used to build the cabin. I purposely left them in place to guard my cabin from the all to frequent break-ins and theft I experienced in my previous cabin. Nice! I’m wondering what’s going on with the panels on the front too. Can we see a picture with them closed – if they do in fact close? Yes, they do close. Here’s an older pic that shows them closed and locked up tight. I think the importance of the colour has to be what you like, not your wife, your readers, or even a sporting buddy. If you are unsure then maybe think about your favourite colour. To be honest… does it really matter when it is a cabin you will be spending most of your time away from (either at your home some 3 hours away, or out hunting or fishing or whatever other sporting you do)? I was being a bit facetious with my comments about color – where’s that sarcasm emoticon when you need it. My comments reflect the discussion my wife and I were having when she started painting the siding. Color is one of those things we often have different opinions on. Are those panels to lock it up tight so no break-ins? Hi there! I came across your blog whilst looking for off-grid plans and sustainable living solutions. Great work, inspirational stuff. I am looking at used shipping containers myself, stacking two on top of each other, 90 degrees to each other, to create an upstairs veranda type area and a garage type overhang below. Thank you for sharing, may you have many happy breakaway times at your cabin! Still can’t believe how nice it continues to get and as always can’t wait on your next post. “Yellow”? Looks more like khaki. Same color our container housing units in Iraq, etc, are painted. Seems plenty manly to me. When I ordered my containers I was told that they had switched over to tan from gray so they could be more readily sold to the military and not need to be repainted – makes sense to me. Thanks Steve. I appreciate your help. Your insight into the flooring and paint makes me more interested because from “running the numbers” this still seems like a great and profitable emerging trend for cost effective housing even with Florida’s real estate debacle. This is a question I’m really not qualified to answer. 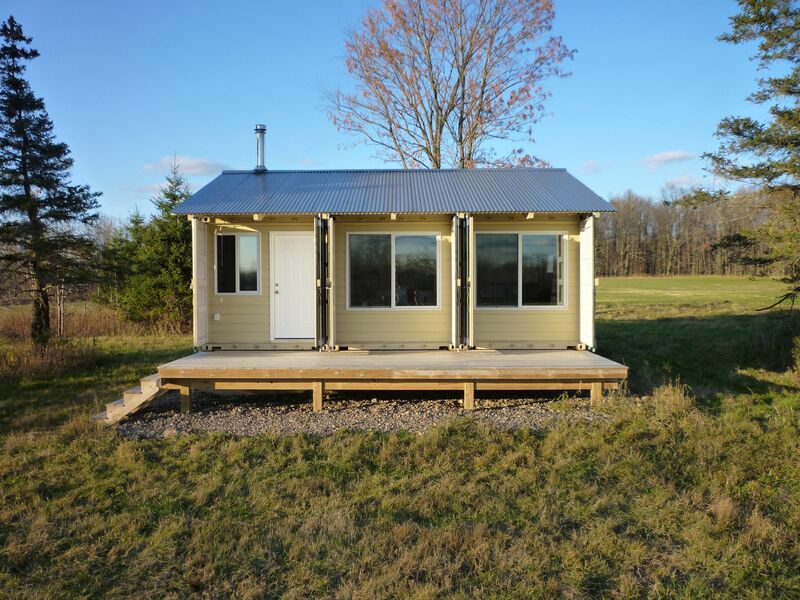 My experience is with a small cabin and not a home. 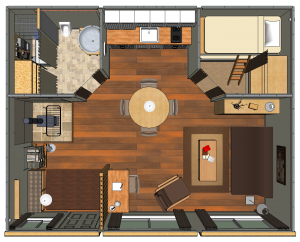 My cabin will have cost me somewhere between $75-$80 per square foot fully furnished. A larger structure will have certain economies of scale, but will also have greater costs in plumbing, heating, cooling, etc. 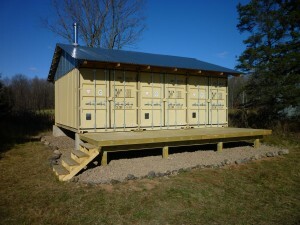 The greatest costs for my cabin were containers, foundation, roof, and insulation in that order. My containers were new, but you could save some money going with used. The foundation was overkill and went close to six feet deep due to frost depth, although I’m pretty sure a foundation in Florida would be a fraction of what mine was. You would also probably want a roof in Florida to keep the sun off the containers, but it could be done for less than mine since you have no snow loads. Thanks, have a great Thanksgiving. Otherwise, go to Bob Vila dot com and type in “Building with containers” in the search feature. Links to all the episodes are below the video. Steve, thank you for starting such an instructive and well thought out blog. As the saying goes, a picture is worth a 1000 words and you’ve done a great job with not only your discription of the process but logging everything with photos. 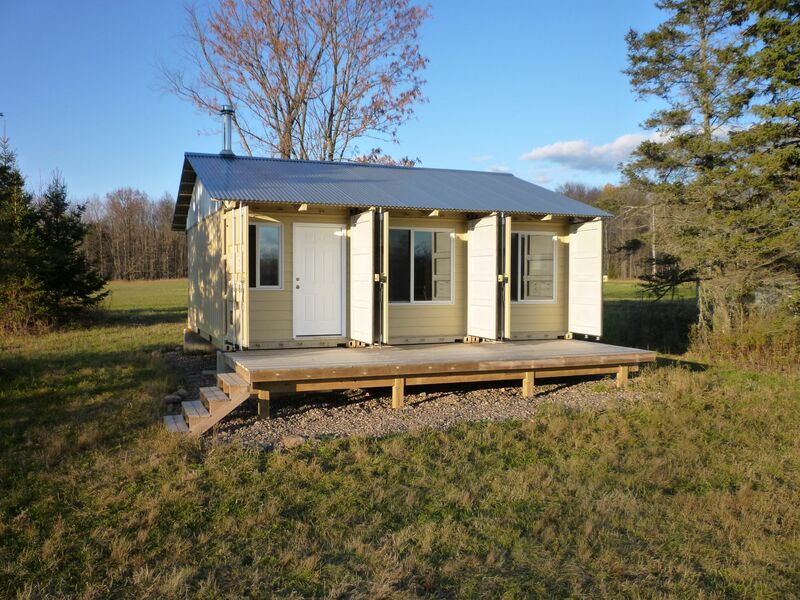 My wife and I are currently looking for that perfect piece of land with hopes of building a container home and I use your site and a handful of others as building blocks for our plans. Very cool project. We are beginning to look seriously at building our next home and this concept is one that we are exploring … looking at something that incorporates 4-5 containers. I’ll continue to be interested in your ongoing experience with this project, particularily how this type of home weathers the WI elements. We happen to be in Wisconsin as well. BTW, any major issues with permitting and approvals for this project? Approval for a project such as this is totally dependent on your local government. I’m pretty sure my cabin doesn’t meet state building codes, but the local officials just don’t care. I’m in a more remote area of northern Wisconsin that’s mostly woods with some smaller farms mixed in. Between all the ramshackle hunting cabins and farm outbuildings that don’t meet code, my cabin doesn’t stand out as a problem. When I requested my building permit I told them it was for a cabin, but they have since reclassified it as a storage building. I’m sure the assessor didn’t quite know what to make of it. 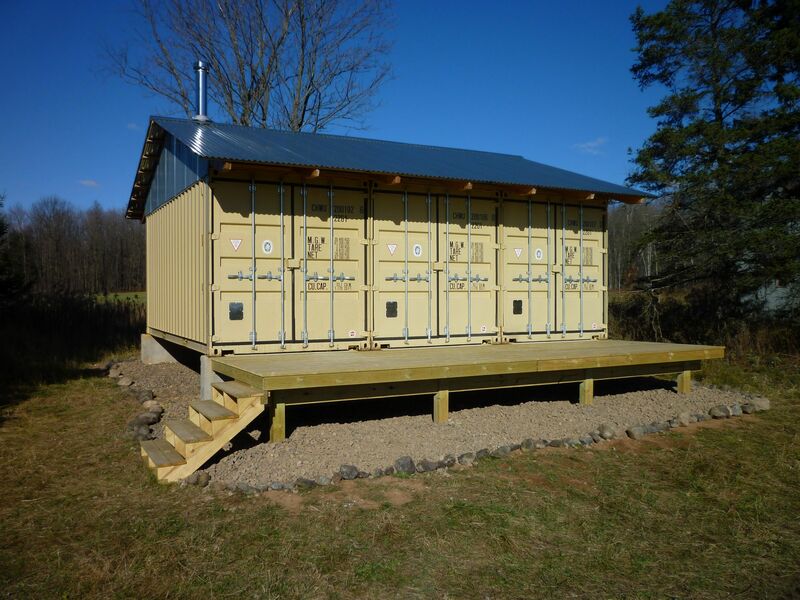 You have done a great job of building your cabin and documenting the process. I’m working on putting together a DIY manual for people who need to know the basics of how to put together their own sustainable dream home. Would you mind if we included your project in our publication? 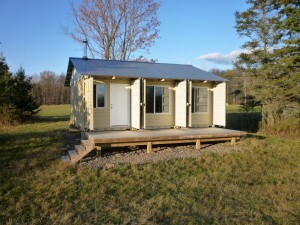 Hi Steve, awesome job on the cabin, the blog and the photo details. Just an oustanding job all around. Couple of questions when you have time. When you were building your roof did you consider having it extend over the porch? When you were ordering your container was there any option of buying it without the plywood floor installed? Or is that just standard? Also I noticed you built some partial interior walls, why not leave more of the container walls to keep some of the structural integrity and to keep from having to rebuild the wall? Just curious. Thanks for your time. I am going to build a 2 container cabin in the panhandle of Idaho. I recommend that you read my Roof Plans post which details the hows and whys of my roof design. In a nutshell, I designed it for solar gain in the winter and shade in the summer. In that regard it has worked very well. Where it fails is the dumping of snow on my deck during the winter, although shoveling some snow is a small price to pay for having some sunlight that time of year. With enough money you could probably buy anything – even containers without floors. One problem is that you’d have to pay for the entire shipping cost from China since there would be no way to ship goods in it. I’ve also heard of metal floored containers before, but have never seen one. I had thought about leaving some of the wall partitions, but in the end it was easier to take them all out. My first concern was cold infiltration and the possibility of condensation on cold metal in the winter. My second concern was sealing it up against mice and other pests. I could probably have foamed the space between the walls, but that seems like too much trouble. Probably the biggest advantage is that if I ever want to change the layout of the cabin it will be much easier with the stud walls. And please send some pics of your cabin when you get started. That’s what I thought might also be a problem with leaving some of the walls, if that cold would be transfered right into the heart of your cabin. I gotta tell you Steve, this is the best documented build job I’ve ever seen, alot of extra work and I really appreciate all your extra time and effort, huge help to alot of us!! Thanks! I will try and document my build as well as you have.